Public spaces in New York City have a rich history of being places of turbulence that fundamentally serve as democratic and multi-use spaces that are free and open to methods of free speech and expression . The role of public spaces in the development of ideas, political views, communities, businesses, and interactions between citizens has allowed them to independently reflect the spirit of the city as a practical and ideological phenomena. 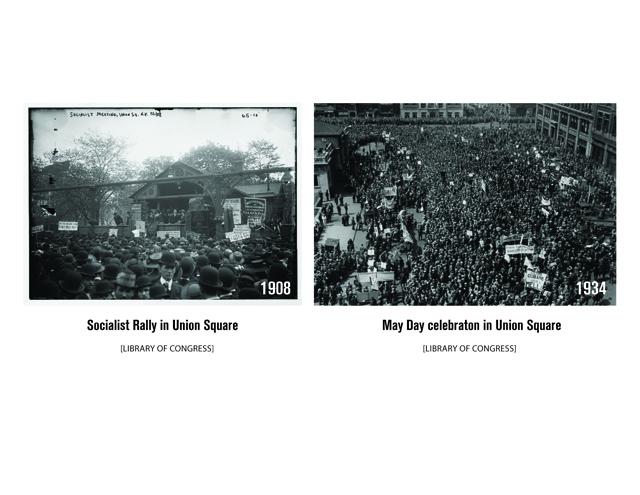 One of the most known public spaces is Union Square, it has served as a location where protests, cultures, free speech expression, and formation of public unity have shaped and created the identity of the space. This public space has previously created a convergence zone for the people of the city to voice their opinions and ideas in powerful ways that have played roles in shaping policy around issues of labor, human rights, foreign policy, inequality, and many other issues that have been made public through the use of assembly and the formation of unity in democratic and artistic expression . With persistent outmigration and threat of potential bankruptcy, the shrinking city budget made it economically impossible to maintain and regulate public spaces. This was one of the main driving factors that led to city owned public spaces transitioning into unsecured precarious spaces peppered with abandoned buildings and the contagion of devalued properties. As a result of this unstable condition, private interests, in conjunction with city government, developed a strategy for revitalizing the city through the creation of public-private partnerships. Union Square served as the first implementation of such a strategy. "The Union Square Partnership, which was the first Business Improvement District (BID) to be set up in New York State in the early 1980s, is both a BID and an LDC; by either name, it is a private organization of commercial property owners that carries out public functions of financing, maintaining, and governing public space". These partnerships or Business Improvement Districts (BIDS) were articulated by business owners looking to create an improved business climate through additional self-taxation funneled through the city government into these pre-determined areas . The strategy proved fruitful for both the businesses involved and the city because it created a working system where city funds could be relieved from the burden of maintaining public areas, and businesses could assert higher levels of autonomy and control over spaces owned by the city. Thus, a different dialogue emerged about the role of public space in the city. The creation of Business Improvement Districts (BIDs) in New York City severely changed the way in which public spaces function and are managed. The self-taxation from the private sector served as a way of relieving financial pressure on the city, and allowed for more public-private security presence in public spaces that led to a highly controlled environment. The additional funds were also used to maintain and improve public spaces, sidewalks, and services; presumably creating an attractive business climate for tourists, investors, and corporations. This new strategy in public-private partnerships proved effective, but at the same time created a new paradigm regarding city and private investment in different public realms. Hardin, in his essay The Tragedy of the Commons, points out how this kind of investment can never be equally maximized to serve the needs of two different interests . The result of these strategies is, of course, a maximization of the Private and corporate interests with little representation to the needs of the citizens using that space. Business Improvement Districts, as we know them today have many adverse and disproportionate effects on the local environment and public spheres. Employing Nancy Fraserbs concept of counter public, we identify these spheres as varied and diverse publics with different users constantly articulating different manifestations of public space . These varied public spheres, or groups of individuals distinguished by their socio-economic background, interests, beliefs, and racial demographic, were affected by the changes to public spaces in a variety of ways . The main disconnect in articulating these improvements to public spaces is that the function has shifted from serving as a location for the use of all people; where conflict, free speech, art, assembly, and expression were staples in the use of the space, into privately controlled areas where the main function was to create a positive business climate, increase private profits, and appeal to tourists and investors. The practices of Business Improvement Districts took on a manifestation where exclusionary methods limited the use and imposed unconventional control of user groups and expression, thus reframing public spaces into one known contemporary model. As can be derived from "New York City Police Department's Police Strategy Number 5: Reclaiming the Public Spaces of New York City" in conjunction with Zukin's "The Naked City", police forces indirectly funded by private interests regulate and control the space. Strict use regulations and permit laws take precedent over the people's right to use the space and in this way public spaces became sites of conformity, control, and leisure . In the case of Union Square, the rich culture of democracy that once existed became a privately controlled area where such activities are remembered as things of the past but not of the present . Joanna Merwood-Salisbury describes the activities of city, private interests, and police as a creation that was "in the service of pacifying what had been a tumultuous and sometimes violent urban space, emphasizing the square as a peaceful and quiet memorial to long ago and now resolved struggles" . "The recent neoliberal phase of globalization of the capitalist economy has the aim of opening up ever more areas of the world and ever more dimensions of reality, and this also means ever more commons, for enclosure or the process of ongoing primitive accumulation" . This proclamation hints at the subversive tactics of mobile technologies reframing the idea of the commons by situating the spatial configuration both material and immaterial in a digital realm that allows for a specific malleable condition to be shaped by active participants and actively observed by non-participants. Shifting boundaries to include inferences of the internet has allowed for a developing parallel discourse of parameters, legality, and participation. This was tested and contested during the Occupy Wall Street protest that occurred during the fall of 2011 where thousands of individuals participated both physically and digitally to help project this movement onto the mainstream stage. By using traditional means of street assembly and the re-appropriation of social platforms, occupiers accelerated awareness of the causations of the protest and instigated participation at various nodes. "Online tools are rapidly changing the dynamics of political action. The aggregative, rhizomatic, and exponentially expanding character of the Occupy movement reflects the distinctive capacities of social media" . This method of open sourced urbanism truncated social dynamisms, displacement of public space, and convergence of contemporary technologies to highlight the presence of an ether-commons that is reshaping our occupation of space and expanding our limitations on the imposed restrictions within these space by using the internet as an intermediary for the representation of our shared values and the reclaiming of public space. Public space is not merely the sequence of spaces between buildings that we move through or abide temporarily; instead, it is a continuous process that defines the relationship between the private and public. It is continuously contested and negotiated on a daily basis . When assessing the contribution of public space to the process of commoning, "there is always a struggle over how the production of, and access to public space and public goods is to be regulated, by whom, and in whose interests2 . Public legislation and private entities like the Business Improvement Districts are diminishing the process of commoning in the physical realm and marginalizing the right to assembly, access to public spaces, freedom of expression, and acts of everyday life. Manifestations of free expression and the right to assembly have been increasingly replaced by virtual manifestations that in recent times have served as catalysts for mobilizing ideas, creativity, protests, and physical demonstrations such as Occupy Wall Street . The internet has created an extensive open source platform for free speech with a global capacity; reaching and mobilizing individuals into a collective commons that is an alternative to conventional methods of protest, assembly, and expression. Many performative and artistic modes of physical expression seek to capitalize on this counter movement and allow it to transcend into a new virtual manifestation of the commons. "The void between building, the open space of the park, and the sky above is a congested virtual ocean of information flows and currents that become the boccupied etherb of today", as explained by William Morrish during a lecture on urbanism and the ether, "The internet, occupying the ether all around us, has become increasingly accessible by technology and transcends limitations placed on physical location" . Physical public spaces have become increasingly privatized with additional restrictive regulations and policing, this evolving phenomena has made the virtual realm a popular alternative to physical space as an outlet for political action. Use of the internet as a tool for interaction and idea proliferation has created a new commons, this new commons is what can be defined as the "ether-commons". Diagram of performative/artistic expression in North Union Square. The ether-commons represented by the virtual act of commoning. This is manifested in the physical realm, but is aggregated in the virtual realm. Assembly, performances, and installations, suggest an integration of the ether-commons into existence by exploring the potential relationship developed through use of a virtual platform for expression, and addressing challenges of generative creative knowledge, various sharing methods, and the creation of multiple dialogue platforms. Extended from the physical realm, virtual participants actively engaged within the same experience by occupying bandwidth as an expressive medium. 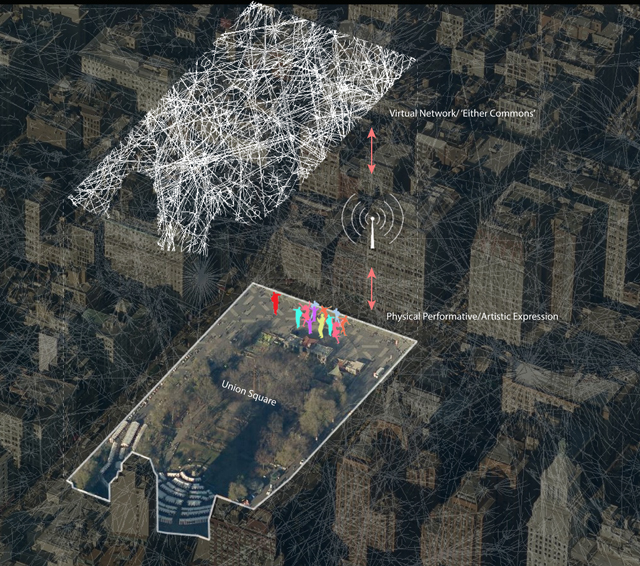 This instigates the tensions created between prohibitive measures, intentional placement, mass assembly, and passive data drivers with specific emphasis on creating a dialogue between all these devices that prompt awareness concerning contemporary social issues and compartmentalization of public space through art. In the creation of the ether commons, the physical manifestation is not to be forgotten, it is the interrelationship between the physical and virtual that can accommodate creation of alternate commons. The physical art creates a collective awareness of questioning the rules and regulations that are applied by private-public entities of the public space, while the virtual exposes a larger audience through the documentation and critique of restraints simultaneously occurring in the physical realm. This expression circumvents imposed rules of BID(s) and restrictive measures of large planned gatherings by indirectly assembling participants through a virtual means and identifying specific site locations. The specificity of site addresses the need for the physical realm as a requirement for creating a commons. However, the internet is siteless and independent and becomes problematic in galvanizing groups as an operative agent of assembly, especially around nontraditional protest matters; but, "the dynamics of political action are changing through online tools" . Social media has the capability to inform larger audiences, it provides stimuli, by means of images, audio, and film. In these instances, these audiences have the potential of becoming participants; a phenomenon that anchored the occupy movement. The intent is not to champion the internet as the final destination for the creation of the "ether-commons" but as a tool to aggregate the process of commoning. It has the potential to become a catalyst for creativity and acts as a springboard for extended creation of conversations surrounding ideas, creativity and knowledge that reinforce the rights of citizens; while activating dormant spaces for participatory engagement as alternatives to spaces where these rights are constantly being renegotiated and repackaged to become less impactful. Movements such as Occupy Wall Street reinforce the rights of citizens through a type of insurgent citizenship. The notion of insurgent refers to multiple/other sources for active created citizenship such as art installations and performances, that are often seen as illegal or challenge state regulation, but serve an economic, social, or political need of specific public sphere . Occupy Wall Street, and other forms of creative insurgency, enable assembly in certain public spaces that are increasingly restricted. They enable new and current members of society to emerge in those spaces and create an awareness and claim their rights, which have been systematically downgraded. Using the benefits of the virtual realm, a strong platform for knowledge and discourse is being created that is different than what the state dictates. Through participation in the process of exchanging knowledge and public discourse, a culture emerges in which citizen rights are renegotiated and discussed in a continuous open manner. 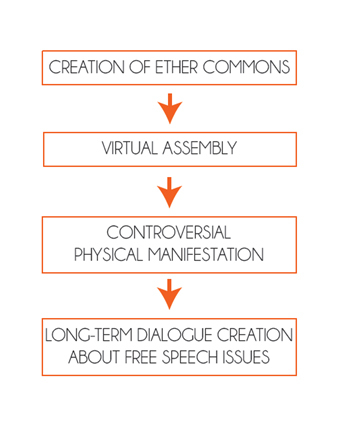 This process diagram shows ether-commoning in practice; seeking to find ways of creating virtual citizenship that is empowered through physical manifestations of the virtual assembly. The goal is to use new avenues of insurgent citizenship in the virtual and the physical to create long-term discourse about the future of the commons and free speech. Understanding the ways in which Business Improvement Districts, in conjunction with legislation, have altered the climate of these spaces to serve primarily private interests that exclude certain citizens, arts and activities is crucial in developing strategies of insurgent citizenship. Current public-private dynamics could be challenged in a constructive way instead of antagonistically, and create a baseline for reclaiming the commons though innovative avenues of expression and long-term development strategies. Holsten's articulation of insurgent citizenship as creative conflict manifests itself in integral and adaptive ways that don't particularly seek to create tension and conflict with Business Improvement Districts, the city, or private entities, but rather seek to engage the public and inspire inquiry, participation, and long term active discourse in a created virtual commons. Merwood-Salisbury, J. (2009). "Design for the crowd In Union Square". In Scapes 8, 22-25. Parsons The New School for Design. Zukin, S. (2011). Naked city: the death and life of authentic urban places, 129-158. Oxford University Press. Hardin, G. (1968). The tragedy of the commons. In Science, Vol. 162, 1243-1248. Fraser, N. (1990). Rethinking the public sphere. In Habermas and the public sphere, 56-78. Calhoun, Craig (Ed). MIT Press. New York City Police Department. (1994). Police strategy no. 5: reclaiming the public spaces of New York City. City of New York. Klein, N. (2001). Reclaiming the commons, 2. In New left review 9. Mies, M. and Benhodt-Thomsen, V. (2009). Defending, reclaiming, and reinventing the commons, 8. Massey, J. and Snyder, B. (Sep 2012). Occupying Wall Street: places and spaces of political action. Retrieved April 17, 2014 from http://places.designobserver.com/ feature/ occupy-wall-street-places-and-spaces-of-political-action/35938/. Harvey, D. (2013). Rebel cities: from the right to the city to the urban revolution. Verso, 67-88. Morrish, W. (2014) Urban colloquium II lecture series. Parsons The New School for Design. Holston, J. (1995). Spaces of insurgent citizenship. In Planning Theory, V. 13, 35 51.